Le Paddle Yoga, c'est le mariage parfait de deux activités harmonieuses en pleine nature. I can only advise you to try the Paddle Yoga. I discovered the Paddle Yoga, along with the Stand-Up Paddle and had never practiced either one of those two disciplines before. I wanted to get back to sport for summer in a gentle and playful way. 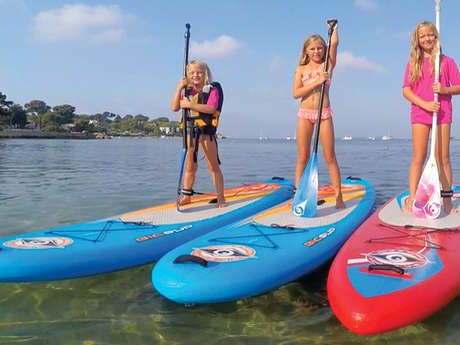 The Paddle Yoga, with Celine, is a moment of pure relaxation combining walking at sea, total disconnection with everyday life while learning, at its own pace, the basics of Yoga. Céline is very listening, caring and adapts to everyone’s rhythm. My favorite position? The warrior’s! Céline was a perfect initator! For my initiation, we settled in the small bay of the Ondes beach, where the sea turtles were released. I’ve never done yoga, just a little bit of Stand-Up paddle. When it came to go into water, Céline explained to me how to hold my paddle and move forward properly from the beach. Arriving in the bay, Céline took time to explain to me the ventral breathing and the movements of salutation in the sun. She was holding my board at first to avoid untimely tipping. The session lasted an hour and we chained the movements of salutation in the sun several times to allow me to master them, then we made a relaxation while lying on the boards. It’s a very good memory, which made me want to continue all summer and even start yoga classes in the studio since this fall.Céline was a perfect initiator.